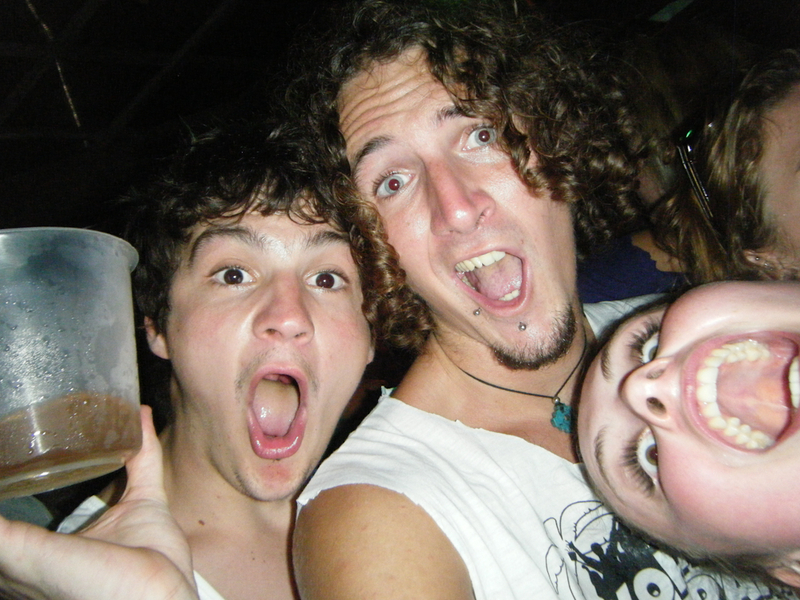 Koh Tao Pub Crawl – Getting Loose on the Island! Now I’m not a massive fan of pub crawls or messy organised drinking, nor do I really like the drunken mess backpackers have turned places like Vang Vieng into but Koh Tao has a pretty nice party scene – it’s relaxed beachside drinking in a place littered with beach bars, fire shows and bean bags…much more my kind of vibe! So when a guy from Koh Tao Backpackers Hostel recommended I check out the Koh Tao Pub Crawl I was a bit more keen to the idea. All for 350 baht – just shy of £8. I roped in the little bro and Jonesy for the ride and a couple of our dorm mates (the hilarious couple Becky and Hugh) and got us all signed up, after all what better way to meet a whole heap of people during our stay on Tao than to get messed up and make some bad decisions?! one way to get drunk…! 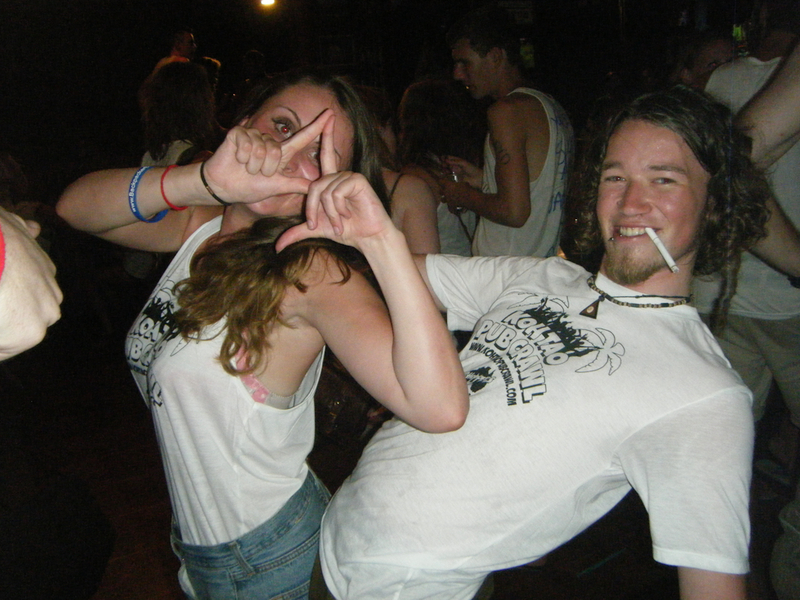 The first stop of the crawl was Choppers Sports Bar – here we were kitted out in KTPC tees, fed a couple shots and given a bucket to get us started. And as the pub filled to pretty much capacity you could tell this was going to be a loose night! Buckets sculled and tees customized it was time to hit the beach for a stint at Lotus Bar. KTPC drink specials were the order of the day and the entertainment kept coming in the form of fire shows and a live band. 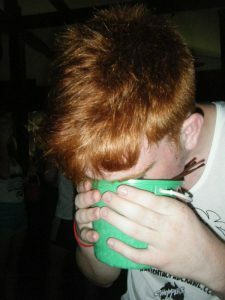 And of course it wouldn’t be a pub crawl without the trademark mingling games which definitely got the banter sorted. Now if you’ve been reading this blog for a while you may have followed my last visit to Thailand. And if you’ve been paying attention you may remember a certain incident where I got dragged on stage and snogged by a ladyboy during my last time on Tao…well the next stop on the KTPC was that exact cabaret bar! Needless to say I boxed myself into a corner and stayed well away from any audience participation! I’m also pleased to say that it was just as entertaining the second time round – especially watching the sheer terror on Jonesys face throughout! Our table hit the jackpot with almost a clean sweep on the giveaways too – never have I seen my brother and Jonesy produce condoms and lighters so quickly mid sprint to win some free tattoo vouchers! If Becky could get her bra off quicker we’d probably have scored the freediving course too! Once everyone was done posing for pictures with ladyboys in all manner of states of undress and costume it was time to really hit the bars and get the buckets flowing. For those who haven’t had the joys (or evils!) of sampling a bucket in Thailand it’s a pretty simple drink; take one sandcastle bucket, empty in about half a bottle of the rather rancid Thai whiskey, splash in a mixture of choice (mines a sprite please) and top off with Thai Redbull. It’s not something you should drink liberally. But everyone does! I have no idea what’s going on here! My first bad decision seemed harmless enough – jumping in one of our free taxi pickups. unfortunately i didn’t clock the guy sat on the floor and landed clean on him! After much apologizing he was cool, although on exiting the pickup he jumped on onto his shoulder and proceeding to spin around…really fast! Being heaps drunk and now dizzy i tried to stay upright – and in some kind of twisted logic that involved attempting to run it off. I narrowly missed a moped but didn’t see the massive stop sign in my path and literally hit it with all the comedy of a cartoon – a stop clean in the face with a loud bang! I think it goes without saying that once it was clear I was ok everyone found it hilarious! Shaking off the impact a nice cold beer helped soothe the embarrassment! 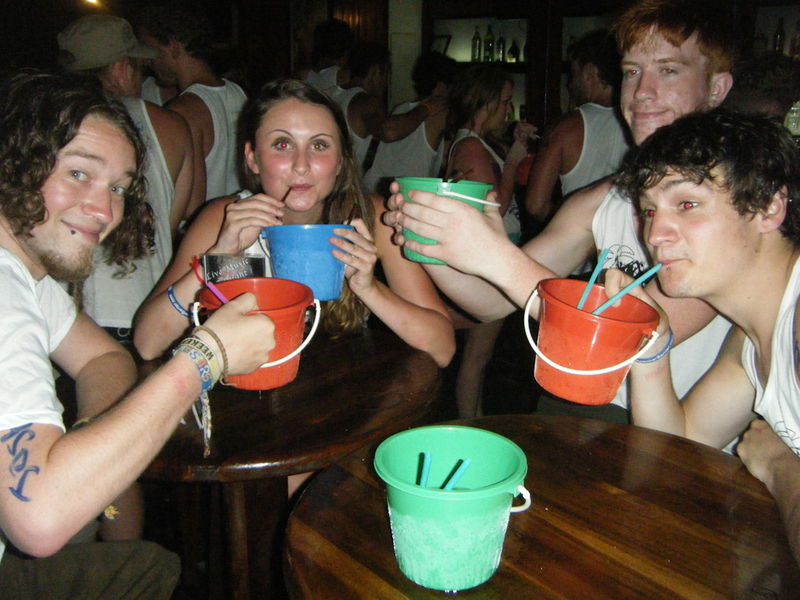 From there on the night merges into a drunken dancing haze with more buckets, beach dancing, more fire, and heaps of banter – eventually we all ended up in a club called fishbowl where it was clear most of us were pretty inebriated! I have no idea what time we all eventually stumbled home – or how we navigated it actually – but the photos tell some rather interesting stories…although I’ve been sworn not to publish them! An epic night overall though – if you find yourself in Koh Tao I highly recommend you sign up for the chaos – check out their Facebook page for a bigger sample of the action! …Beckys face says it all really! Sounds like a great time! We attend many beer festivals herein Wisconsin, can only imagine that times three! Hannah @ getting stamped recently posted..Flying around the world for FREE! it was absolute chaos…but AWESOME! Yikes – carnage. I hear those pub crawls are starting to attract quite a big crowd each time. i’m not surprised – it was a great way to meet new people and party hard! I’ll see how crazy it’s got when i go back next month! Best fun we had in Thailand! hahaha not a bad night out hey?! carnage. I hear those pub crawls are starting to attract quite a big crowd each time.